Response time analysis helps identify the root cause of performance problems. Developers can drill down into a production database to learn how a code is performing. Gives admins the information they need to be prescriptive about hardware recommendations. Experienced DBAs know that most database performance issues are not related to CPU power or other hardware constraints, but from poorly written queries and inefficient indexes. Throwing more hardware at the problem is not the solution. You need a way to effectively optimize your databases. 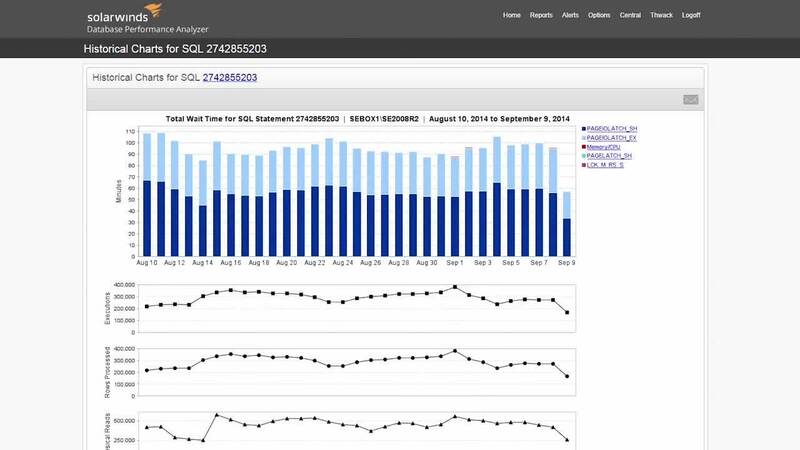 SolarWinds® Database Performance Analyzer offers response time analysis, which is the fastest way to analyze SQL statements, identify the root cause of performance problems, and get expert tuning advice for all major commercial databases. Application performance is often put off until the deployment phase, which can be too late. Many performance solutions put a load on monitored production servers, making production performance analysis less than ideal. Yet, accessing query performance on production servers improves SQL performance because it incorporates application performance in the development cycles. Database Performance Analyzer monitors development, test and production servers with less than a 1% load. With the Database Performance Analyzer dashboard, developers can drill down into a production database to learn how a code is performing. It is common to see admins investing in the latest hardware without first identifying the root cause of a performance issue. Database Performance Analyzer helps align resource provisioning with database performance, which gives admins the information they need to be prescriptive about hardware recommendations. Database Performance Analyzer collates SQL statement data every second, and helps rank these statements based on response time. This helps developers and DBAs identify the best SQL query to focus on. It also offers guidance on ways to improve performance, which rarely involves purchasing new hardware. "With our current environment this product is invaluable to my team for problem resolution. We could not do our jobs as efficiently, nor could we solve problems as quickly, without this product. " 88% of slow performance issues can be traced back to the database. Maintaining top application performance 24/7 is a real challenge. Budget constraints create further complications for DBAs.